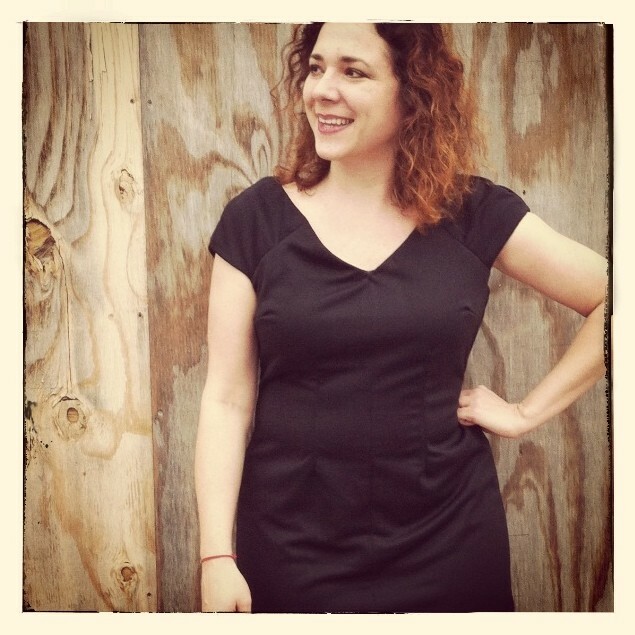 I did it: I finished a little black dress. Whoo-hoo, cheering, applause, etc. Except that…well. I’m pretty much not happy with the results at all. As a finished garment, it is in no way competitive with anything I would buy off the rack as a “little black dress”. It looks, instead, rather like a high school home economics project. It turns out that while during the process of sewing, the black fabric hides every single stitch and issue, making it difficult for me to see what I’m working on, the inverse of that is true with the finished garment: in black, every single stitching/fit problem is highlighted and visible for all to see. See that slight puckering at the center of the neckline? That’s from an imperfect join of lining to dress fabric, where even tightly clipped, I couldn’t get the lining to lay right and had to hand-tack it in place with a few stitches. Front and center, clearly visible to the eye. Then there’s the drag lines on all the seams, and on the darts. Drag lines on darts? I have no idea what is going on, there. The seams sag, the fabric pooches under my belly when I lean forward, the whole thing twists and bunches and hangs weirdly. It’s crazy, because the other dress I’ve made with this same pattern is one of my favorites to wear, but this one doesn’t work, at all. So you win some and you lose some–this one is getting hacked to pieces, quickly. I don’t want to even look at it, but I might chop it off and add a wide elastic waist and convert it to a quick pencil skirt. 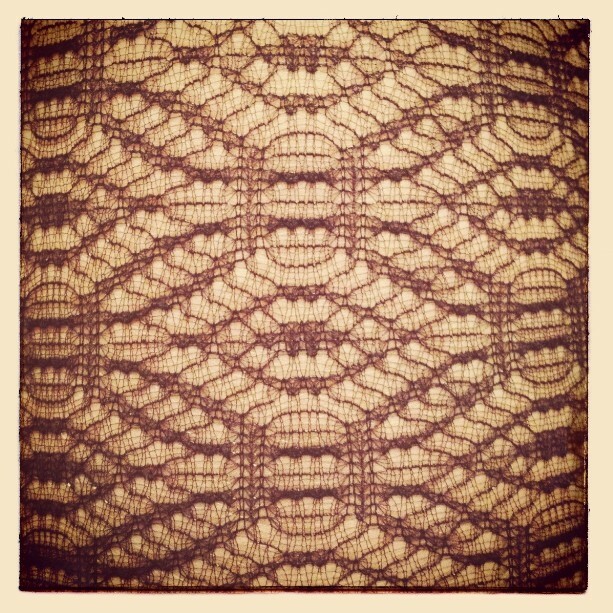 In the meantime, I also, disappointingly, put holes into the fabulous textured tights I was wearing with it. Goodbye, lovely tights–you were fun while you lasted. I’m working on a little black dress. You might remember from last year that this is where my “make all the things” intention ran into its kryptonite: I just could not get inspired to sew a solid black dress, and so I bought one instead. Alas, here I am, a couple of weeks (and three sewing days) into the new year, with no black dress to show for it. The trouble has been a variety of things: at first, I intended to make it with French seams, so I laid all the foundation seams “wrong sides together” before realizing my chosen fabric was too thick for that. So then I ripped all the seams. Black stitches hiding tight in black fabric, inch by dark inch. Next, I turned the (rather square-shaped) sleeve pieces the wrong way, not noticing how the dark fabric also hides the grainline, if the seamstress is not paying very close attention. Out came the seam ripper once again. Now, I have attempted to understitch a black lining beneath a black fabric, and something is just “off”. 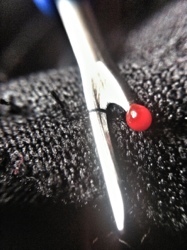 My seam ripper is brought into service one more time, to remedy this difficulty. So in summary: it’s not just an aesthetic difficulty, getting inspired to undertake a black sewing project. I believe it is objectively more difficult to sew, as black fabric presents inherent challenges to the process. One day, I will post “ah-ha!” pictures. Until then, all I have to offer is my trusty seam ripper, picking out stitch by stitch. 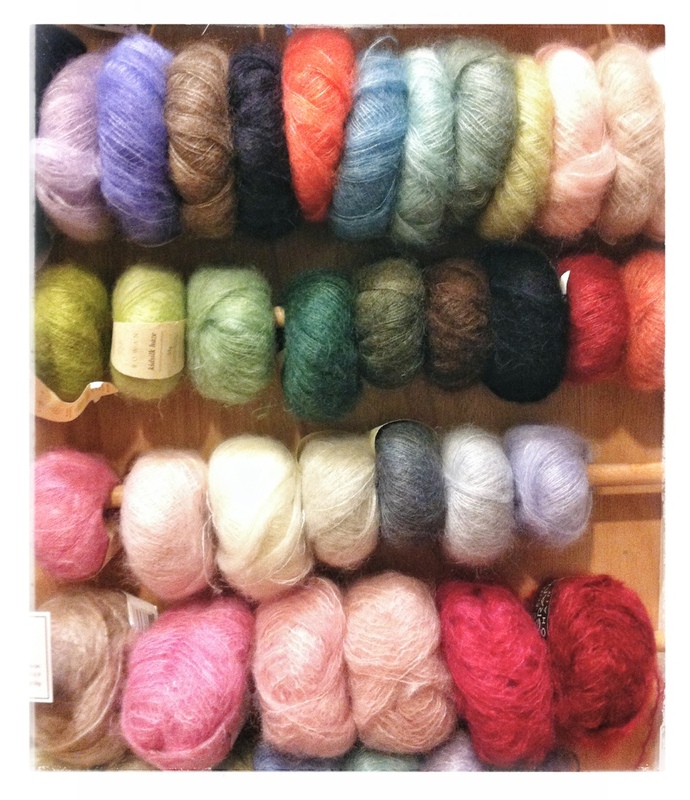 Look at them, all lined up so cutely, so temptingly, in my local yarn shop yesterday: skeins of Kidsilk Haze. The most yummy balls of yarn, all soft and squishable like baby kittens, in glorious colors. (I’m particularly taken with the orange and blue nestled together so nicely on the top row). But this is how they get me, every time. They look sooo sweet, and I think “surely, I can have just one!” So over the years I have purchased…let me think–I’m going to be totally honest with you, here: I have purchased at leastseven skeins of this stuff. Guess how many projects I have finished from this yarn? Not one, ever. I have made one cuff from a set of two, one half of a scarf, and one third of another scarf. Not once have I been able to reach completion with what I envision, while standing here being tempted by this particular rack of frothy fiber. It’s just too cobwebby to work with, too fragile and temperamental…or else it’s just too far a division between fantasy and reality: what I see in mind’s eye contemplating the spun wool, versus what comes off my needles once I’ve had my way with it. Sigh. It is not to be, my lovely little skeins of fuzz. No more with you. I will go home and squeeze one of the seven colors to which I have already fallen prey. …and knitting, and crocheting. It’s merely the “taking photos and blogging about it” part that’s fallen by the wayside. Turns out that’s a hobby and an interest all its own. So: no grand declarations, no promises, just start one tiny step at a time. I’m still making and wearing handmade, still buried neck-deep in unfinished projects. 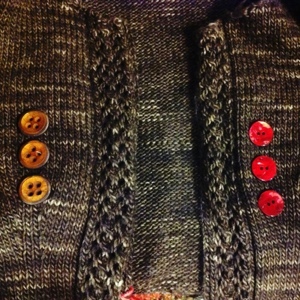 This is a cardigan I’ve been plodding through–frogged it halfway to fix some fit issues. I’m pretty happy to be at the “choosing buttons” stage, because that means I’m back on track. And oh yes: I chose the red.